I have, on occasion, envied those who had one single childhood home, a single place within four wall that house all their memories. Some people, I realize, grow up in one place, then inherit it from their parents and raise their own children there. Many of my best friends' parents still live in the homes where I visited them, street addresses I know by heart, for which I'll never need GPS. For my family, such as not the case. Throughout my childhood, my dad was a preacher, so we moved from one preacher's home--property of the church--to another whenever he changed jobs. Our first home, the one we still call "the little red house" had been theirs, built right next door to my grandparents and ours until I was nearly grown, but the next several--Oakland, Eastwood Drive, Alabama Street, Knud Drive (our one foray out of the state of Alabama) and Pearl Street--were perfect metaphors for the Christian life: This world is not my home; I'm just a'passin' through. When I was a teenager, my parents decided they needed to build some equity and bought a house, the one I most closely connect to my teenage years, but by the time I was in college, they moved out to a farm house--then back to the previous house. When I married, they moved again, and again, and... Well, you get the point. While other people have decades of hidden treasures in their attics, we have the boxes, but they move from attic to attic (or basement to basement). Some of the boxes, we realize too late, never make the move. I finally have found the benefit to these moves--which in my married life I have mimicked as well. As I've been reading Joshua Foer's work Moonwalking with Einstein, a study of memory, I learn that one of the best tools for memory is a wide variety of familiar places in which to store memory images. He cites the story of Simonides, who was able to recreate the names of the people killed when a wall collapsed in a building right after he spoke--then exited, by connecting people's names or faces to their location within the room. That tool has been used for years since to help others store their memories in what are called "Memory Palaces." Foer began investigating the phenomenon of memory after discovering that a group of individuals who considered themselves Mental Athletes (MAs) compete annually for national and international titles as Memory Champions. He discovered that contrary to what most people assume, good memories are made, not born. In fact, he agreed to work with one of the competitors for a year to prepare himself for competition. Along the way, Foer researched and interviewed people with exceptional, remarkable memories, as well as those with the worst memories, such as the man who lost the part of his brain responsible for recalling memory to a brain-eating herpes simplex virus. As a result, he can have the same conversations over and over without realizing each time isn't the first time. This called to mind the novel The Housekeeper and the Professor, the story of a Japanese math teacher whose current memories, as a result of a car accident, are reset every eighty-something minutes, leaving his expertise in the field of mathematics as sharp as ever. In order to remember many different kinds of information, then, some must travel, gathering as many memory palaces as possible. While my friends still living in their childhood homes must look around for other memory storage options, I have a long way to go before I ever have to leave home--or homes. For reputation's sake, I must say, here at the beginning, that I wasn't a David Cassidy fan--or a Partridge Family fan, although I will admit to watching the show and to knowing enough of the songs and lyrics to be able to pass in some circles. 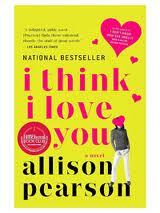 When someone recommended this book, I think I recall her calling it a "guilty pleasure" or maybe a "light read." Being something of a book snob, I pick and choose carefully, knowing that any book I read means one I will never get to read down the line. Something about the description of this one, however, prompted me to take that time, and I am glad I did. The narrative hook of the story, revealed early, occurs when a grown woman from Wales discovers, while going through her late mother's closet, that she had actually won the "Meet David Cassidy" contest when she was thirteen--a trip to Los Angeles with a friend. But her mother never told her. Ouch. Pearson takes the reader back to the angst-filled early teen years (I know, it's a redunancy) when the only thing she wants more than to meet--or perhaps marry--David Cassidy is to feel sure she belongs, that her friends really are friends. The daughter of a Welsh working class father and a strict, disappointed German mother, Petra is a gifted cellist--invited to play for Princess Margaret--who would chuck her talent if it meant possibly being left out. She and her closest friend Sharon spend hours studying The Essential David Cassidy magazine as if they were prepping for the MCATs, as well as all the other mags appealing to girls--those that point out their flaws and how to camoflage them--then prints an article on how to have a positive self-image, the irony of which, Petra observes, they didn't realize until they were much older. Moving from Petra's (and Bill's) younger years to their full adulthood, Pearson brings the two together, when Petra, learning of her mother's deceit, calls the publisher's office (still home to a range of popular magazines) to demand her prize. For anyone interested in life's fairness, readers also learn the fates of the other girls in Petra and Sharon's circle of young friends. As an added bonus, the author also includes her interview with the now-middle-aged Cassidy, a Vegas performer, not fully at peace with her hearthrob teen idol years. In my odd mix of reading, I sometimes finish a book without thinking of anyone in particular who might enjoy reading it as well. As I read I Think I Love You, I found myself calling or email friends and sisters close to my age before I'd even finished the book. "Where'd you get that map?" For people of my generation and my parents', November 22, 1963, is one of those handful of days that I mark with "where I was when" memories. November 22, 1963 is evidently Stephen King's first time travel novel--one he admits in the epilogue that he tried to start years and years ago. The novel unfolds as a high school English teacher discovers (or is led to) a portal to 1958, through which he must travel in order to stop the Kennedy assassination, believing that in turn he may stop a number of historical tragedies that resulted--Vietnam, the deaths of Bobby Kennedy and Martin Luther King. He learns that no matter how much time he spends in the Land of Ago, he returns just two minutes after he left. Since he must always enter at 1958, he stands to age five years in those two minutes. If the story had focused mainly on the Kennedys and that so-called Camelot, it would have been a different book. Instead, Jake Epping, who must go by the name George Amberson (printed on his vintage identification, makes friends--and enemies--and falls in love along the way. The characters throughout the novel become conscious of the butterfly affect--the exponential change brought about by the slightest events. A recurring theme King's protagonist explores is the "obdurate" nature of the past--and the "harmonies." For readers who aren't King fans, I'd recommend the book as one part alternative history, three parts love story. The woman Jake/George loves, with her own complicated story line, proves as engaging as Marina Oswald and more present in the book than Jackie. When I read Emma Donoghue's novel Room, I was able to remind myself, "This is fiction." 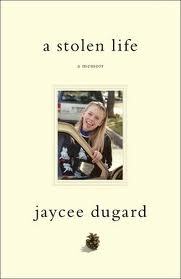 That story, told in the voice of a young boy born to a mother held isolated by the man who kidnapped her, was unquestionably influenced by the story of Jaycee Dugard. Now Dugard has written her own story, even reading for the audio version of her memoir, A Stolen Life. Most people became aware of at least some of her story when she was rescued after being held for incomprehensible eighteen years by the man who kidnapped her when she was eleven years old. During that time, she gave birth to two daughters, fathered by Phillip Garrido, the man who held her. Most difficult to believe, Garrido's wife Nancy was aware of her presence the whole time, even interacting with her. Dugard explains in the beginning of the book what prompted her to tell the story, when most people can believe she would want only to put the events behind her. She explains, though, her belief that people--especially children--who are harmed by others should be encouraged to speak up, to accuse those who abuse them, not be held captive by shame they could not have avoided. Her narrative also helps readers to understand why she never attempted the escape, even when her physical constraints were loosened. This is a story of emotional manipulation of a child and young woman. Throughout the order, she found ways to learn and, when her daughters came along, to be sure they were educated. Like Donoghue's Room, Dugard's story doesn't end with her rescue and return to her family and to the outside world. She describes the hounding by the press, the noble actions of many of the law enforcement officers who took part in her rescue and protected her throughout those emotional early days, and the comforting reassurance of her mother's continued hope and unfailing love. These details can't overshadow Dugard's feeling that her captivity was prolonged by the failure of authorities to follow through, particularly Garrido's parole officers, who never investigated the family's backyard, where she was held. Shortly after finishing the book, I saw the news that Elizabeth Smart, another high-profile victim of kidnapping, has announced her engagement, something she did publicly not by choice but because of pressure from the press to know and tell everything. With Dugard's experiences fresh in my memory, I wished for both these strong girls the respectful privacy they deserve as they attempt to reclaim their lives.